Habit: Annual, perennial herb; hairs often hard from calcium deposits; generally monoecious. Stem: trailing or climbing, 1--many; tendril generally 1 per node, often branched. Leaf: generally simple, alternate, generally palmate-lobed and -veined, petioled; stipules 0. Inflorescence: at nodes; staminate flowers in racemes, panicles, small clusters, (or 1); pistillate flowers generally 1. Flower: unisexual [bisexual], radial; hypanthium > ovary; calyx generally 5-lobed (or +- 0); corolla rotate to cup- or bell-shaped, generally 5-lobed; stamens 3--5 (or +- 1--3 from fusion), anthers twisted together, often > filaments; ovary +- inferior, chambers 3--5, placentas parietal, styles 1--3, stigmas generally lobed, large. Fruit: berry, drying or not, or capsule, irregularly dehiscent, often gourd- or melon-like. Seed: 1--many. Genera In Family: 100 genera, 700 species: especially tropics; some cultivated (Citrullus, watermelon; Cucumis, cucumber; Cucurbita, gourd, pumpkin, squash; Luffa, loofah; Sechium, chayote). Note: Several cultivated species included Bryonia dioica reported as waifs in California (Howell 1958 Wasmann J Biol 16:1--157), but none recently. Habit: Perennial herb; tuber large; occasionally temporarily dioecious. Stem: +- scabrous or hairy, glabrous in age; tendril branched. Leaf: +- round, +- cordate, +- 5--7-lobed. Inflorescence: staminate flowers in racemes or panicles (or 1 flower per node early); pistillate flower 1 per node, generally at same nodes as staminate. Flower: sepals 0; staminate flower 3--15 mm wide, rotate to cup-shaped, white to cream or yellow-green; stamens fused, anthers twisted together; stigma (pistillate flowers) 1, +- hemispheric. 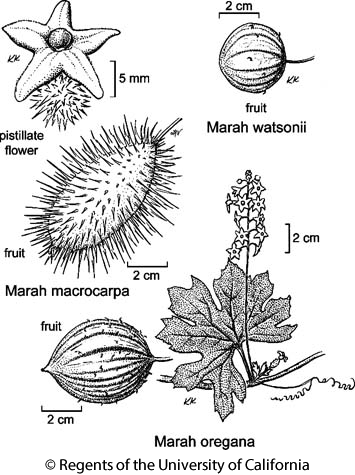 Fruit: capsule, irregular-dehiscent from tip, +- symmetric, 3--20 cm, spheric to ovate or oblong, +- prickly, beak << body or 0. Seed: 1--many, generally > 1 cm, +- ovate, +- flat. Unabridged Note: Sometimes included in Echinocystis. Habit: Herbage not glaucous. Flower: corolla generally > 8 mm wide, shallowly cup-shaped, white. Fruit: 5--12 cm, oblong, generally rounded at both ends (occasionally with sharp beak); prickles +- dense, stiff, unhooked. Seed: generally > 6, 13--33 mm, ovoid to oblong, not flat at 1 end. Chromosomes: 2n=32,64. Ecology: Washes, shrubby or open areas; Elevation: < 900 m. Bioregional Distribution: SW, DSon; Distribution Outside California: Baja California. Flowering Time: Jan--Apr Note: Several varieties based on trivial features of leaves, fruit spines, seeds. Synonyms: Marah guadalupensis (S. Watson) Greene; Marah macrocarpa var. macrocarpa; Marah macrocarpa var. major (Dunn) Stocking; Marah macrocarpa var. micrantha (Dunn) Stocking; Marah macrocarpus var. major (Dunn) Stocking, orth. var. ; Marah macrocarpus, orth. var. ; Marah macrocarpus var. macrocarpus, orth. var. ; Marah macrocarpus var. micranthus (Dunn) Stocking, orth. var. Unabridged Note: Marah gilensis (Greene) Greene (fruit 2--3 cm) in Arizona, New Mexico. Citation for this treatment: John M. Miller & Robert L. Schlising 2012, Marah macrocarpa, in Jepson Flora Project (eds.) Jepson eFlora, http://ucjeps.berkeley.edu/eflora/eflora_display.php?tid=101919, accessed on April 19, 2019.